Balinese temples are not places where people gather for daily worship, so they are generally very quiet when there is no particular ceremony going on. Visitors are welcome to enter temples to look around and take pictures almost anytime. Nonetheless, appropriate temple dress and behaviour are still necessary. If there isn't a ceremony in progress, dress requirements are a little more lax. 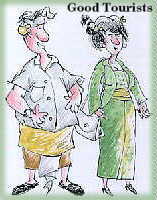 All you need is a sarong, sash and a modest shirt (with sleeves, not low-cut). If you forgot to bring a sarong and sash, at many temples you will find them on sale just outside. Many tourist attractions which sound like they're not temples, actually are, and the same dress code applies (Gunung Kawi, The Elephant Cave, holy springs and sacred bathing places, etc.). As for behaviour, just remember you are in a sacred place, Climbing up on statues and shrines is definitely not OK.